Winter activities are still very much underway at our Lake of the Woods resort. You’re going to want to join us for the last few months of our winter season! At River Bend’s Resort and Walleye Inn in Baudette MN, you’ll find lots of ice fishing and snowmobiling to keep your days busy. Here are two of our favorite winter-related activities you’ll be able to enjoy when you vacation with us, this winter. Winter tends to be cold, and we’ve gotten a lot of snow this year. Which means you’ll want to check the weather before coming to our beautiful Lake of the Woods resort. Bundle up because our fantastic fishing and snowmobiling will keep you outside throughout the day. While you have a blast in the snow, you’ll want to stay outside until the sun goes down behind the horizon. Did you know you can snowmobile almost to the front of our Walleye Inn? That’s right, from Baudette to our Lake of the Woods resort there are over 100 miles of groomed snowmobile trails for you to experience this winter. 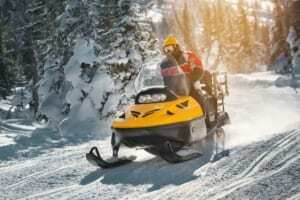 Check out this interactive map by the MN DNR for updates about the snowmobiling trails. Ice fishing is one of our more popular winter activities, and we’ve got all the equipment, so you just need to bring your family and friends along for one of the best winter trips. Our guides move our ice houses regularly to ensure you catch some fantastic trophies. Plus, we’ll make sure you’re toasty in the cabins and that your pre-drilled holes are ready for lines. However you choose to enjoy your vacation trip to our Lake of the Woods resort, River Bend’s Resort and Walleye Inn will keep you cozy throughout the season, while letting you bask in all that the winter outdoors allows.